Micromachines make their way into optical switches, multiplexers, and crossconnects to enhance data flow over optical networks. Tiny machines, so small that they’re invisible to the human eye, are tackling a wide array of challenges in the manufacturing of automobiles and airplanes, in chemistry and biology, and in medicine and sensing. In optical communications, these silicon micromachines—also known as micro-electro-mechanical systems (MEMS)—are showing up in optical switches, add/drop multiplexers, optical crossconnects, and other critical components. The devices have the potential to revolutionize lightwave systems or put the power of a laboratory in the palm of your hand. Manufacturers make MEMS devices by using integrated circuit (IC) batch-processing techniques. Even though the fabrication process is complex, the volumes involved make it economically viable. A typical fabrication cycle begins with a silicon wafer on which multiple layers are deposited and lithographically patterned. Some of the layers are acid-soluble sacrificial oxides included as spacers. Once the deposition process is complete, sacrificial oxide layers are etched away to release elements that may be hinged, spring-loaded, or otherwise suspended (see figure 4.1). The microfabrication techniques used allow designers to build devices that are tens to hundreds of microns in size. Figure 4.1. After deposition and patterning (top), the sacrificial oxide layers are etched away to release the device (bottom) so that individual parts can move under electrical actuation. MEMS manufacturing benefits from the considerable technological resources of the IC fabrication industry. At the same time, the scale of the devices allows them to be manufactured using previous-generation equipment. In an era in which an IC fab costs $1 billion and becomes obsolete in less than five years, the ability to reuse the equipment for a new class of cutting-edge products is enormously appealing. 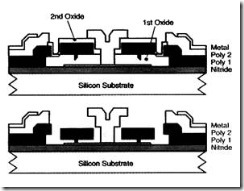 IC fabrication techniques also allow designers to integrate micromechanical, analog, and digital microelectronic devices on the same chip, which produces multifunctional integrated systems. Despite their size, MEMS devices have proven to be robust and long lasting, especially those whose parts flex without microscopic wear points. One of the interesting things about MEMS is that the physics of devices at the microscale can differ completely from physics at the macroscale. Richard Feynman predicted this behavior in a paper he wrote in 1959, well before MEMS became commonplace in the photonics industry. At the macroscale level, electromagnetic forces, for example, are strong and electrostatic ones are weak. At the microscale level, however, the situation is reversed. Another example of this role reversal is the relative importance of friction and inertia. For objects the size of human beings, inertia is relatively important, while friction is less so. At the microscale, friction becomes the dominant effect, while inertia is unimportant. A paramecium, for example, never would be able to discover inertia and Newton’s second law. At Bell Laboratories (Murray Hill, NJ), our group has focused on telecom devices such as optical modulators, variable attenuators, switches, add/drop multiplexers, active equalizers, and optical crossconnects. We see applications—and opportunities—for MEMS components throughout lightwave systems, in the core networks, in passive optical networks, and in metro rings. Indeed, in these places a MEMS-based solution may be the best choice. Our team has developed a 1 * 2 MEMS optical switch that achieves a response time of less than 70 µs. The design features a mirror connected to an electrostatically activated see-saw that is driven by a flat plate. Applying a voltage between the suspended plate and the substrate generates a force that pulls the plate down and displaces the mirror. In the «on» position, the see-saw positions the mirror to deflect light from one fiber to another; in the «off» position, the mirror is pulled out of the way to allow the optical signal to pass undeflected. Depending on the design, the actuation requires from 1.24 V to 20 V, with negligible steady-state power consumption. It has loss of less than 1.5 dB with passive alignment and less than 1 dB with active alignment. At each node in a fiber-optic network, some wavelengths must be added, dropped, or passed. An add/drop multiplexer can use an array of micromirrors to perform this function. A grating spectrally demultiplexes the signal and sends each channel to a separate mirror in the array that routes it to either the output port or the drop port. The array can switch up to 16 wavelengths at speeds of 20 µs with better than 30 dB switching contrast. From a carrier viewpoint, the ideal network would allow flexible provisioning and rapid restoration after service interruptions. Large MEMS-based optical crossconnects offer a viable way to accomplish this. A typical design consists of an array of two-axis micromirrors facing a fixed mirror or a second MEMS array. Light from an input fiber is focused onto one of the micromirrors, which routes it to the appropriate output micromirror by bouncing it off the fixed mirror at a specific angle. The output micromirror then sends the signal to a designated output fiber. Such fabrics are low loss, require minimal power, and work independently of data rate and data format. They operate at both 1.3 µm and 1.5 µm and can scale to very large port counts.